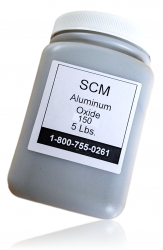 180 Aluminum Oxide 5lbs Jet Stream One. Use the RED Nozzle only. NOTE: Use the RED nozzle with this grit.... The 150 grit is a little more aggressive for a little deeper engraving on glass and some ceramic mugs. We recommend the 5 mil Photo Image film for this. Jet One is not a stone carving system.